Tattoos are an ancient art form with origins that trace back as far as the Stone Age (12,000 BCE). Tattoos have remained popular throughout time and across many cultures and continents. Although most psychological studies of persons with tattoos have been restricted to psychiatric inpatients, prisoners in correctional institutions, and military personnel (thus reflecting only specific populations), one common conclusion is that, of all the motives for obtaining a tattoo, the quest for personal identity is central. The skin serves as a useful canvas on which to portray statements of individuality, sexuality, belonging, machismo, frustration, boredom, and anger. However, the quest for identity by teenagers often becomes irrelevant or embarrassing by age 40 years, and 50% or more of individuals later regret their tattoos. Egyptian mummies from 4000 BCE show evidence of attempts at tattoo removal. However, since most people live in the present moment, rather than in anticipation of future endeavors, tattoos remain popular. Unpublished data from the Candela Laser Corporation indicate that, in the United States, 9-11% of men have tattoos and 50,000-100,000 women actively pursue tattooing as body art each year. In general, tattoos are not well received by the public and often create a barrier to employment. Individuals with tattoos are often perceived as antisocial, aggressive, or immature and as being unable to accept controls and authority. Laser tattoo removal. Courtesy of James Mutter (own work) [CC BY-SA 4.0 (http://creativecommons.org/licenses/by-sa/4.0)], via Wikimedia Commons. Another tattoo-related Medscape article is Tattoo Reactions. Additionally, the Medscape Dermatologic Surgery Resource Center and Aesthetic Medicine Resource Center may be of interest. Little is known regarding the natural history of an intradermally placed tattoo. A report of serial biopsy examinations of tattoos placed at 24 hours; at 1, 2, and 3 months; and at 40 years offers insight into this process, as does an electron microscopic study of tattoos treated with Q-switched ruby lasers (QSRL), argon lasers, and tunable dye lasers. Initially, ink particles are found within large phagosomes in the cytoplasm of both keratinocytes and phagocytic cells, including fibroblasts, macrophages, and mast cells. The epidermis, epidermal-dermal junction, and papillary dermis appear homogenized immediately after tattoo injection. At 1 month, the basement membrane is reforming, and aggregates of ink particles are present within basal cells. In the dermis, ink-containing phagocytic cells concentrate along the epidermal-dermal border below a layer of granulation tissue that is closely surrounded by collagen. Pigment is not seen within mast cells, endothelial cells, pericytes, Schwann cells, in the lumina of blood and lymphatic vessels, or extracellularly. At 1 month, transepidermal elimination of ink particles through the epidermis is still in progress, with ink particles present in keratinocytes, macrophages, and fibroblasts. Reestablishment of an intact basement membrane prevents further transepidermal loss. In biopsy specimens obtained at 2-3 months and at 40 years, ink particles are found only in dermal fibroblasts, predominantly in a perivascular location beneath a layer of fibrosis, which replaced the granulation tissue. Rabbit studies support the theory that fibroblasts are responsible for the stable intracutaneous life span of the tattoo. Ink particle aggregates were usually surrounded by a single membrane, giving the impression that they were partially free in the dermis; however, the aggregates were not found to be free in several studies. In one study, aggregates were present, both extracellularly and within fibroblasts. The interpretation of free extracellular tattoo pigment may be a consequence of the difficulty of detecting the single membrane seen by some investigators. Tattoo pigment has been reported both intracellularly and extracellularly, with mild fibrosis and occasional foreign-body giant cell reactions, with allergic granulomas, and with sarcoid reactions. Tattoo particles are initially dispersed diffusely as fine granules in the upper dermis, as well as in vertical foci at sites of injection, but they aggregate to a more focal, concentrated appearance from days 7-13. In one study, black ink granules had a mean diameter of 4.42 µm, while Taylor et al  found black pigment granules in tattoos to be polymorphous and varying from 0.5-4.0 µm in diameter. Turquoise and red pigment particles are approximately twice as large as black granules. In both amateur and professional tattoos, the depth of the pigment ink varies greatly, with a greater variability in size, shape, and location noted in amateur tattoos. Regardless of the diverse origins of tattoo pigment, the light and electron microscopic appearance of all pigments are similar, except for color. A prominent network of connective tissue surrounds each of the fibroblasts that contain ink particles, effectively entrapping and immobilizing the cell. The life span of these fibroblasts is unknown and may persist throughout the individual's life. Although these studies provide considerable detail regarding the architectural morphology and physiology, they do not fully explain the natural history of dermal tattoo ink. Commonly, a tattoo appears duller, bluer, more indistinct, and blurred with time, presumably as a consequence of ink particles moving deeper into the dermis through the action of mobile phagocytic cells. Random biopsy samples of older tattoos demonstrate pigment in the deep dermis, in contrast to the more superficial location of newer tattoos. Eventually, tattoo ink appears in the regional lymph nodes of patients with tattoos. Tattoo ink is remarkably nonreactive histologically, despite the frequent use of different pigments of unknown purity and identity by tattoo artists. Amateur tattoo inks consist of simple, carbon particles originating from burnt wood, cotton, plastic, or paper, or from a variety of inks, including India ink, pen ink, and vegetable matter. Although it rarely occurs, red (mercury), yellow (cadmium), green (chromium), and blue (cobalt) tattoo pigments have elicited a persistent, localized allergic or photoallergic dermatitis and, more infrequently, systemic reactions. Interestingly, the colors most commonly involved in allergic reactions (red and yellow) often spontaneously disappear from a tattoo without clinical signs of a reaction. The main disadvantage with mechanical destructive modalities is the high risk of scarring; hypertrophic scars are common when tissue is removed deeply in an attempt to extract all of the tattoo pigment. In addition, residual tattoo pigment is common, and postoperative pain can be significant. Dermabrasion is the primary method of mechanical tissue destruction. To remove as much tattoo pigment as possible, a rapidly spinning diamond fraise wheel or a wire brush abrades skin that is usually frozen with a skin refrigerant (eg, Frigiderm) to produce a hard surface. The procedure tends to be bloody. Tissue and blood particulates, of a size that can access pulmonary and mucosal surfaces, are aerosolized into the operative suite and may carry infectious agents. Subsequent scarring is worse if complete pigment removal is attempted in one session by creating a wound to the full depth of the tattoo pigment. Removing tissue only to the depth of the papillary dermis minimizes scarring but leaves significant tattoo pigment, requiring additional procedures that increase the scarring potential. To enhance efficacy, gentian violet or tannic acid and silver nitrate are applied to the superficially abraded surface. Exposed pigment is curetted or removed with fine tweezers. Other mechanical treatments include linear incisions, scratches, punctures, and a grid of crisscross abrasions followed by the application of a caustic chemical. Surgical excision of skin containing tattoo pigment is also common but often results in incomplete tattoo removal, tissue distortion, and scarring because of limitations in wound closure and healing. Small tattoos located in areas of adequate skin laxity that allow primary closure without excessive tension can be satisfactorily removed with simple excision and the benefit of only a single treatment. However, this situation rarely occurs, and complex wound closures, skin grafting, multiple-staged excisions, and the use of tissue expanders are often necessary to repair the tissue defect created by excision. These techniques commonly result in scarring and tissue changes that are unacceptable to the patient. Split-thickness tangential excision without grafting has been reported, but it has the same limitations as dermabrasion. In 1888, Variot first described the use of caustic chemicals (tannic acid and silver nitrate) after disruption of the skin surface with punctures and incisions. This technique, known as the French method, results in a scar that is less coarse than that from the application of more destructive chemicals but often leaves variable amounts of residual tattoo pigment. A combination of superficial dermabrasion and an application of tannic acid also resulted in hypertrophic scarring in 34% of patients and residual tattoo in patients with deep tattoo pigment. Intradermal injection of tannic acid by using reciprocating needles results in epidermal and superficial dermal slough and has the same risks as other destructive modalities. Phenol solution, used in the same manner as in facial peels, and trichloroacetic acid in a 95% solution remove tattoos but result in hypopigmented scars. Repeat application is hazardous and may result in a full-thickness burn that requires skin grafting. Thermal injury via fire, hot coals, and cigarettes has been used for centuries to try to remove unwanted tattoos, usually with significant scarring. Thermal cautery, with a glowing soldering iron or an electrical spark for electrodesiccation or electrocautery, is equally crude and unpredictable. The infrared coagulator, developed in West Germany in 1979, delivers a noncoherent, multispectral light with preset pulses triggered by an electronic timer. This instrument attempts to produce a more controlled cutaneous thermal injury that treats cutaneous vascular lesions and tattoos. A tungsten halogen light is the energy source, and it emits light with wavelengths of 400-2700 nm and a maximum emission near the infrared range at 900-960 nm. At this range, the primary tissue chromophores are water and oxygenated hemoglobin; however, when exogenous black and blue tattoo pigments predominate as target chromophores, a nonspecific thermal burn from heat absorption occurs. Pulse duration can vary from 0.8-1.5 seconds; pulses of 1.25 seconds and 1.5 seconds have been reported, with a 1.125-second pulse achieving coagulation to a depth of 1 mm. These pulse durations exceed the thermal relaxation time of tattoo particles, blood vessels, and other dermal structures, thus producing nonspecific damage. A quartzlike guide transmits light to a 6-mm sapphire tip, which is placed on the skin surface. This technique has little advantage over the other nonspecific methods reviewed because scarring is inevitable and incomplete tattoo removal is common. Similar to the other removal modalities, amateur tattoos are more responsive to treatment than professional tattoos. In general dermatology, liquid nitrogen (-196 °C) is commonly used to destroy superficial cutaneous lesions, but it is not useful in tattoo removal because the nonspecific destruction leads to prolonged healing and unpredictable results. However, successful treatment has been described, in particular two 30-second, freeze-thaw cycles for the treatment of digital tattoos. Early on, it was hoped that lasers would provide a precise means of inducing predictable thermal necrosis to tattoo-containing tissue to eliminate scarring. In 1963, Goldman first proposed tattoo removal by using ruby and argon lasers, and a relatively enthusiastic report of the normal mode ruby laser was followed by another report concerning the QSRL. Goldman's  initial report of successful tattoo removal using ruby (694 nm) and Nd:YAG (1060 nm) lasers appeared in 1967. A study of QSRL interaction with tattoo pigment appeared the same year, and further studies confirmed this specific laser-tissue interaction. Unfortunately, these early reports were ignored as attention focused on argon and carbon dioxide lasers. The first report of an argon laser used for tattoo removal appeared in 1979 and involved 28 patients. Although hypertrophic scarring occurred in 21% of the patients and one half of the patients had residual tattoo pigment, the complete removal of tattoo pigment in 8 patients (29%) with acceptable cosmetic results (excellent, without scarring) led the authors to an enthusiastic recommendation of this laser for tattoo removal. In their subsequent study, 20 of 60 patients experienced complete removal of tattoo pigment without scarring, with amateur tattoos responding slightly better than professional tattoos. Unfortunately, hypertrophic scarring occurred in 35% of the patients, and residual tattoo pigment remained in 67%. Although the initial choice of the argon laser was based on selective absorption of energy with vaporization from its 488-nm and 514-nm wavelengths by complementary tattoo pigment colors, its clinical usefulness was limited by melanin and hemoglobin absorption, resulting in unwanted thermal damage. Selective heating of tattoo pigments and their immediate surroundings were originally believed to elicit an inflammatory response and to help remove or obscure the pigment. A histologic study was performed to determine if oxidizing or fragmenting tattoo pigment was possible, thus confining thermal necrosis to a zone immediately adjacent to tattoo particles and avoiding widespread thermal necrosis of the dermis. The argon laser used powers ranging from 1-3.5 W and shuttered pulses of 0.2 second and 50 milliseconds, in addition to a continuous beam using a 1-mm spot size. At 48 hours, subepidermal blisters were overlying necrotic papillary dermal collagen, with all treatment parameters. At 3 months, fibrosis was present in the papillary and upper reticular dermis. Pigment-laden macrophages were present at the junction of fibrotic and nonfibrotic dermis, with pigment present at a deeper level within the dermis. Thus, even though the authors demonstrated somewhat selective absorption of laser energy by tattoo pigment (threshold for black and red tattoos was 6.25 J/cm2 compared with 20 J/cm2 for injury to normal skin), the 50-200 millisecond pulses allowed extensive diffusion of heat from all absorbing chromophores, resulting in nonselective thermal destruction. The inflammatory response was minor; clinical improvement depended on widespread necrosis that removed pigment and resulted in fibrosis that altered light transmission through the dermis to obscure underlying residual pigment. Fitzpatrick and Goldman  confirmed these results and the lack of a specific laser-induced change in tattoo pigment particles as a result of argon laser therapy. Although Apfelberg et al  reported that the argon laser was comparable to the carbon dioxide laser for tattoo removal, the relatively low-power emission of the argon laser resulted in inefficient removal of tattoo pigment and a high incidence of hypertrophic scarring. Initial reports of successful tattoo removal with the carbon dioxide laser appeared in 1978, [14, 15] and other reports soon followed. [16, 17] The carbon dioxide laser emits a continuous beam at 10,600 nm, a wavelength completely absorbed by water, limiting penetration to a depth of 0.1-0.2 mm. Instantaneous transfer of heat from laser absorption by the water in tissue results in immediate vaporization. The physics of this interaction were initially misinterpreted to imply that this always resulted in confinement of thermal damage to the 30- to 50-µm layer of laser impact. In reality, thermal diffusion can be extensive when a continuous beam is used. Even with pulses of 50-200 milliseconds, great caution is necessary to avoid unwanted thermal necrosis. The original objective of carbon dioxide treatment was to vaporize tissue by using visual control to remove all tattoo pigment in 1 treatment session. Attempts to confine the depth of tissue vaporization to the precise level of tattoo pigment, which often varies from one portion of the tattoo to another, resulted in a variable wound depth. Histologic evaluation of the created wounds revealed loss of dermis and subcutaneous tissue up to a depth of 5 mm. Because of a slow healing time (3-6 wk) and resultant thick, unsightly scars, most physicians did not attempt complete pigment removal in 1 session; instead, they treated patients more conservatively, relying on macrophage engulfment and transepidermal removal of tattoo pigment during the healing phase. Residual pigment was retreated after healing was complete. Originally used as a continuous beam, repetitive pulses of 50-200 milliseconds or superpulsed carbon dioxide lasers became more acceptable with reports of good results in 29 of 30 tattoos after an average of 2.4 treatments. Although only a 7% incidence of hypertrophic scarring was noted, vaporization confined to the tattoo may result in a scar the shape of the original tattoo; therefore, feathering into normal tissue is recommended. Power settings of 8-25 W were common for repetitive treatments with higher powers, vaporizing tissue more rapidly. Because residual tattoo pigment commonly occurs following superficial carbon dioxide laser vaporization and because the risk of hypertrophic scarring increases with subsequent treatments, researchers explored methods to improve the results of a single treatment. Although the concomitant use of 2% gentian violet to prolong the exudative phase following superficial carbon dioxide laser vaporization did not increase efficacy, 50% urea paste improved results, as reported in conjunction with the argon laser. Tissue was vaporized only to the papillary dermis. A generous application of 50% urea in hydrophilic ointment was applied to the wound and covered with a nonstick dressing, then changed daily with reapplication of the urea ointment for 1-2 weeks until tattoo pigment was no longer seen on the bandage. This method usually removed more than 95% of the tattoo pigment after a single laser treatment. Recently applied tattoos respond better to treatment (particularly during the first month after application) with the carbon dioxide and argon lasers, presumably because pigment is more uniformly superficial in the papillary dermis, lying free rather than within dermal fibroblasts. Hypertrophic scarring depends more on anatomical location than on operative technique (25% for deltoid and chest areas, 10% for other locations), and although excellent results can be obtained, cosmetic results are unpredictable and scarring usually occurs. In summary, the carbon dioxide laser removes tattoo pigment much the same as the argon laser, although with higher fluences; however, tissue vaporization with the carbon dioxide laser is much more efficient. Tattoo pigment is removed by direct tissue vaporization, as well as thermal necrosis of adjacent tissue and through loss of pigment in the exudative healing phase. Dermal tissue is reconstituted by fibrosis and scar tissue. Anderson and Parrish's  principle of selective photothermolysis revolutionized the treatment of tattoos. They proposed that if a wavelength was well absorbed by the target and the pulse width was equal to or shorter than the target's thermal relaxation time, the heat generated will be confined to the target. To specifically target tattoos, laser wavelength and pulse duration must be chosen appropriately. In one of the earliest studies, coworkers examined the effects of a tunable dye laser at 3 wavelengths (505 nm, 577 nm, 680 nm) using a 1-microsecond pulse to remove black, blue, red, and white tattoo pigment. They found the threshold dose needed to induce the same histologic changes was much less than that required for the argon laser, and each wavelength reacted only with complementary colors of tattoo pigment. However, despite the short, 1-microsecond pulse, widespread tissue necrosis was observed, and tattoo lightening occurred only as a result of significant dermal necrosis and resultant fibrosis. They postulated that a shorter pulse, in the nanosecond range, would interact best with the micrometer-sized pigment granule's approximate thermal relaxation time. To selectively destroy tattoo ink, the best wavelength is chosen to achieve selective absorption for each ink color, while minimizing the nonspecific thermal effects from the primary endogenous chromophores, hemoglobin, and melanin. Black ink is the most common color seen in tattoos, followed by blue, green, red, yellow, and orange. More recent tattoos have a greater range of colors, including shades of pink, brown, purple, and fluorescent colors. Reflectance spectra data for tattoo ink colors may help in selecting the best wavelength. Because of difficulties with absorption spectroscopy, diffuse reflectance spectroscopy was studied (unpublished data from the Candela Laser Corporation) to model tattoo ink using 17 tattoo ink colors and 6 variants of black tattoo ink mixed with gelatin. Reflectance spectra were obtained from 450-1000 nm for each pigment to provide information on their absorption properties. Many tattoo inks are a mixture of colors with a wide range of tint (blue, green, violet, orange) and are difficult to classify as a single pigment. When a color is a mixture of 2 or more pigments (1 of which is reflective, 1 absorptive) some of the reflected light from nonabsorbing pigment reaches the absorbing pigment, causing plasma formation. The resulting reaction may affect both pigments because of the proximity of the 2 pigments in the mixture. Also, note that the differing composition of amateur (elemental carbon) and professional (organic dyes mixed with metallic elements) tattoos may partially explain why the latter responds less favorably. However, the primary difference between amateur and professional tattoos may be the former's usual paucity of pigment granules. Of 25 tattoos studied, 5 of the 8 amateur tattoos were among the 10 with the lowest volume of pigment granules and cleared rapidly. Overall, tattoos responded according to their total pigment volume. In 1965, Goldman documented the earliest report of tattoo pigment interaction with short-pulsed lasers. He compared the reaction of a dark blue tattoo to a QSRL with nanosecond pulses to that of a microsecond-pulsed ruby laser. He found nonspecific thermal necrosis with microsecond impacts, while nanosecond impacts only produced transient edema accompanied by a peculiar whitening of the impact area, which lasted about 30 minutes. No thermal necrosis was present, but tattoo fragments remained in the dermis. The mechanism of this reaction was unknown but not believed to be thermal because of normal measurements taken with a thermistor. Because retention of tattoo pigment was reported, this modality was originally interpreted as a failure. However, Goldman followed the patient's progress and noted continued fading of the treated area. In 1992, Goldman communicated that he was unable to continue this work because his engineer had been fatally electrocuted, and the project was abandoned. Three years later, other investigators confirmed and expanded these results by using a QSRL (694 nm, 20 ns) to remove blue and black tattoo pigment successfully without tissue damage. Biopsies performed after 3 months showed absence of tattoo pigment and no evidence of thermal damage. These effects were dose dependent, with fluences of 5.6 J/cm2 or less showing absence of thermal damage but incomplete pigment removal. Higher fluences led to subepidermal blistering similar to a second-degree burn and dermal fibrosis at 3 months, although pigment removal was more complete. Subsequent studies concluded that this treatment modality was impractical because of the small target areas and the risk of coagulation necrosis of tissue surrounding the tattoo pigment. Reid et al  continued to study the QSRL, and, in 1983, they published an additional report on the removal of black pigment in professional and amateur tattoos. They reported good results, particularly with amateur tattoos but noted several disadvantages, including the need for multiple treatments (often 6 or more) for complete pigment removal. They also reported scarring in 2 patients and emphasized the need to use relatively low powers (but above the threshold to produce immediate tissue whitening) and the importance of the treatment interval. At least 3 weeks between treatments were necessary for tissue healing and pigment removal by macrophages. In vitro tests showed an immediate reaction in the ink that could be explained only by a chemical reaction. Biopsy specimens revealed evidence of ink fragmentation into smaller particles, which were then phagocytized by macrophages. These 2 phenomena correspond with clinical observations of an immediate reduction in visible pigment in the first week after treatment, followed by gradual fading over the next several weeks without further therapy. By using a 40- to 80-nanosecond pulse, they treated 41 tattoos 5 times at doses of 1.5-4 J/cm2. Of 27 amateur tattoos, 8 cleared at a rate greater than 75% (all treated at 4 J/cm2) in an average of 2.6 treatments. None of the 14 professional tattoos reached this level within 5 treatment sessions, and frequent purpura and rare, punctate bleeding occurred. Twenty-eight tattoos with residual pigment were treated up to 5 times at fluences of 5-8 J/cm2 with more tissue damage, frequent purpura, and occasional superficial erosions noted. At the completion of this phase, more than 75% clearance was achieved in an additional 10 amateur tattoos (average of 3.5 treatments) and 3 professional tattoos (single treatment). The overall results were excellent in 78% of amateur tattoos but in only 23% of professional tattoos. Despite these discouraging statistics, the authors were optimistic that the QSRL would become the preferred treatment for tattoos because of the rare result of scarring. In addition, the authors stressed that the competitive absorption by melanosomes, which led to vacuolization of melanocytes and keratinocytes, with hypopigmentation noted in 39% (low fluences) to 46% (higher fluences) of patients. Normal pigmentation was reestablished progressively over a 4- to 12-month period; however, 4 of the 10 tattoos examined 1 year after treatment still showed confettilike hypopigmentation. The authors agreed with previous investigators that the immediate whitening represents rapid, localized heating with steam or gas formation, resulting in dermal and epidermal vacuolization. An unexplained brief emission of white light as the laser pulse struck the tattoo pigment was noted. Interestingly, histologic persistence of altered tattoo pigment in areas of clinical clearing was noted, suggesting a change in the optical properties of the tattoo pigment. This study did not establish an optimal treatment interval. Although the mean interval was 3 weeks, intervals of 1-5 weeks were used with no statistical difference in response. Blue and black pigments were most responsive, whereas green and yellow responded less well and red was poorly responsive to the red wavelength (694 nm). Purpura and punctate bleeding most likely represent indirect vascular injury from photoacoustic waves generated by the laser's interaction with tattoo pigment. Scheibner et al  reported preliminary results of treatment of 101 amateur and 62 professional tattoos using fluences of 2-4 J/cm2 with a 40-nanosecond pulse width, spot sizes of 5 and 8 mm, and a treatment interval of 5-6 weeks. Although response details are lacking, after an average of 4 treatments, 87% of amateur tattoos were more than 80% clear, while of 62 professional tattoos, only 11% were more than 80% clear. Treated areas required 10-14 days to heal, remained erythematous for an additional 1-3 weeks, and developed hypopigmentation lasting 2-6 months in most patients. Skin textural changes resolved over 6-8 weeks, with no scarring reported. Tattoos of the face and the neck responded faster but were more sensitive to tissue damage, necessitating lower fluences. A better response was noted with older, professional tattoos and blue inks in comparison to other colors. As stated earlier, Taylor et al reported on light and electron microscopic analysis of QSRL-treated tattoos. After irradiation, all of the 3 previously described particle types were still found, in addition to the round, lamellated, electron-lucent particles measuring 25-40 nm found more commonly in the deeper dermis and subcutaneous fat. These altered particles are believed to originate from the 40-nm particle. After treatment, pigment granules measured approximately 1 µm (compared with the original size of 4.0 µm) and were loosely packed. Granules in the papillary dermis measured 0.2-0.4 µm and were densely packed. Again, clinical clearing correlated poorly with histologic clearing because tattoos that responded well often had residual pigment. The mechanism of action of the QSRL is through photon absorption by tattoo pigment within fibroblasts. During the 40-nanosecond pulse, temperatures exceeding 1000°C can occur. Gaseous products of pyrolysis or pores created by superheated steam may account for the lamellated appearance of the granules after laser exposure. The reduction in pigment particle size and fragmentation of pigment-containing cells probably results from rapid thermal expansion, shock waves, and potentially localized cavitation. Fluence-dependent thermal damage to collagen immediately surrounding the irradiated tattoo pigment also occurs. Newer ruby lasers with a shorter pulse duration (approximately 25 ns), higher fluences (8-10 J/cm2), and better beam quality clear tattoos more rapidly. Lowe reported similar results by using 10 J/cm2 at 6- to 8-week intervals, and after 5 treatment sessions, reported that 22 of 28 professional tattoos showed excellent results (>75% improvement). A preliminary report by Levins et al  was similar, with excellent results and minimal side effects. Kilmer and Anderson  initiated treatment at a fluence of 6-8 J/cm2 with a 40- to 80-nanosecond pulse width and reported black and green ink to be the most responsive, with other colors requiring significantly more treatments. Amateur tattoos usually required 4-6 treatment sessions, and professional tattoos usually required 6-10 sessions; however, in some patients as many as 20 treatment sessions were needed. They noted several trends: professional, distally located, recently acquired, or deeply placed tattoos may be difficult to remove, requiring more treatment sessions to completely eradicate them. Acceptable clearing varied greatly from patient to patient, with some individuals more accepting of vague residual pigment. The QSRL is remarkably effective in removing tattoos with minimal scarring, although multiple treatment sessions are required. Hypopigmentation is common (occurring in >50% of patients), and although usually transient (2-6 mo), may be permanent. Transient hyperpigmentation is also common and seems to be related more to skin type than to laser treatment. Scarring and textural changes rarely occur. The risk of adverse tissue response and the speed of clearing both appear to be fluence and pulse-width related, with higher fluences and shorter pulses more effective but causing more nonspecific tissue damage as well. High-energy short pulses cause a pressure shock wave that ruptures blood vessels and aerosolizes tissue with potentially infectious particles, requiring the use of a protective barrier or plastic tube to protect the operator. The use of larger spot sizes with lower fluences eliminates this problem to a large extent. The occurrence of scarring or tissue textural changes has also been attributed to hot spots within the beam and pulse-to-pulse variability. The QSRL effectively removes black, blue-black, and green ink, although green ink can be difficult despite reflectance spectra predictions that it will respond at 694 nm. Other colors respond poorly to the QSRL. The laser has a repetitive rate of 1 pulse every 1-2 seconds, but no aiming beam to assist in proper alignment. Bleeding and tissue splatter can be cumbersome, but cone devices protect the operator from exposure. The Q-switched Nd:YAG laser was explored in anticipation that its longer wavelength (1064 nm) would increase dermal penetration and decrease melanin absorption, thus improving the response of QSRL-resistant tattoos and avoiding pigmentary changes. An initial report of 20 professional and 3 amateur tattoos in 4 treatment sessions showed the Nd:YAG laser equal to the QSRL in removal of blue-black tattoos at 6 J/cm2. Hypopigmentation and skin texture change were more common with the QSRL than with the Q-switched Nd:YAG laser. Green and red pigments were not removed with the 1064 nm Nd:YAG laser; however, some green pigment was removed with the QSRL. The ability of the Q-switched Nd:YAG laser (1064 nm, 10 ns, 5 Hz) to remove pigment in QSRL-resistant tattoos was assessed in the treatment of 28 tattoos (23 professional, 5 amateur) using fluences of 6-12 J/cm2 with a 2.5-mm spot size. In most patients, more than 50% lightening of residual tattoo ink was noted with the first treatment, with the greatest improvement seen with higher fluences. Unfortunately, the higher fluences (12 J/cm2) and shorter pulses (10 ns) resulted in more tissue debris and bleeding. A plastic shield was required to promote laser operator safety. Kilmer et al  investigated both QSRL-resistant tattoos and untreated tattoos in a prospective, blinded, dose-response study by using the Q-switched Nd:YAG laser. Twenty-five professional tattoos and 14 amateur tattoos were treated in quadrants by using 6, 8, 10, and 12 J/cm2 and a 2.5-mm spot size. Four treatment sessions were performed at 3- to 4-week intervals. More than 75% ink removal was seen in 77% of black tattoos, and more than 95% ink removal was seen in 28% of tattoos (11 of 39 patients) treated at 10-12 J/cm2. No significant difference was seen in the response of previously untreated tattoos and QSRL-resistant tattoos. Treatment at the highest fluence (12 J/cm2) proved more effective (P< .01) at removing black tattoo ink than 6 and 8 J/cm2. Green, yellow, white, and red inks resisted treatment and cleared 25% or less after 4 treatment sessions. Purple and orange inks responded minimally. Although textural changes were noted during the course of treatment, these cleared with time and only 2 of 39 tattoos were graded with trace textural changes present. No hypopigmentation and a single case of hyperpigmentation were noted. These results were similar to those reported by Ferguson and August. Biopsy of treated tattoos revealed fragmentation of black ink particles up to 1.5 mm below the surface. Little, if any, fibrosis was seen in the superficial dermis. In addition, biopsy samples demonstrated that after clinical clearing of the tattoo, ink remained in the dermis, as reported with the QSRL. Kilmer et al noted that despite increased bleeding and tissue splatter, the lack of both clinical scarring and histologic scarring is most likely attributable to the lack of thermal injury to collagen. The dermis and the epidermis sustain mechanical injury from the photoacoustic wave, but this trauma is apparently highly reparable. Textural changes generally resolve within 4-6 weeks, suggesting an optimal treatment interval of 6 weeks or longer. The authors also noted a bright flash of white light from the tattoo during laser exposure, as mentioned with the QSRL. Because 1064-nm light is not visible, this flash must result from either a laser-induced plasma incandescence or an incandescence of tattoo ink particles. These both imply temperatures higher than 500°C. The Q-switched Nd:YAG laser offers a great advantage for treating darker-skinned patients. Jones et al  and Grevelink et al  demonstrated effective tattoo removal with minimal hypopigmentation or hyperpigmentation. This outcome provides a significant benefit over the QSRL for darker-skinned patients in whom melanin absorption is a hindrance. The Q-switched Nd:YAG laser is somewhat more effective in removing black ink, creating rare textural changes and almost no hypopigmentation. These improvements are attributable to the longer wavelength, higher fluence, and shorter pulse width. These same factors cause more bleeding and tissue splatter during treatment, making the treatment more cumbersome. The faster repetition rate (1-10 Hz) shortens the treatment session, although this is somewhat counterbalanced by the smaller beam size (4 mm vs 5-6.5 mm for the QSRL). Currently, larger spot sizes up to 6 mm are available with new, higher-powered Nd:YAG laser systems, which also enable deeper penetration and more effective treatment of deeper, denser tattoos. Better beam profiles minimize epidermal damage and decrease bleeding, tissue splatter, and transient textural changes. Often, little wound care is needed. The primary disadvantage of the 1064-nm wavelength is the limited color range, which is basically restricted to black and dark blue/black tattoo pigment. However, a frequency-doubling crystal is a feature of this laser, which provides a 532-nm wavelength to effectively treat red ink. More than 75% removal of red ink was reported with 3 treatment sessions; orange ink and some purple inks respond almost as well. However, yellow ink responds poorly, presumably because of its dramatic decrease in absorbance from 510-520 nm. Because of the laser's 1064-nm wavelength absorbance by melanin and hemoglobin, blistering and purpura frequently occur. The third Q-switched laser developed for the treatment of tattoos, the Q-switched alexandrite laser, has a wavelength of 755 nm, a pulse width of 100 nanoseconds (50-ns pulse width is available in newer models), and a repetition rate of 1 Hz. The 3-mm diameter beam is delivered via a fiberoptic system or an articulated arm. Reflectance studies at 755 nm suggest excellent absorption by black pigment, good absorption by blue and green, and poor absorption by red pigment, as confirmed by preliminary studies performed on tattooed Yucatan minipigs. One treatment session provided excellent results in removal of black ink, good results with blue and green, and poor results with red ink. Efficacy was fluence related. Unlike previous reports concerning the QSRL and Q-switched Nd:YAG laser, histologic clearing correlated with clinical clearing. Similar to reports of the other Q-switched lasers, fragmentation of tattoo pigment was followed by macrophage engulfment and gradual clearing of the pigment but with clinically clear tattoos devoid of ink at histologic examination. Interestingly, tattoo pigment was progressively altered during this process, initially appearing as sharp-bordered grains of pigment in clumps and assuming a progressively amorphous form and lighter color within the macrophages. No clinical or histologic reaction in collagen, scarring, or atrophy was seen in laser-treated sites. The Q-switched alexandrite laser was initially studied with 30 tattoos using fluences of 4.5-8 J/cm2. Test sites using 3 fluences up to 6 J/cm2 were evaluated at 4 weeks. The appropriate fluence was then selected, and treatment was begun. A second test was performed when none of the previous fluences revealed significant lightening. Fluences of 6 J/cm2 or higher were used once the tattoo had lightened by 20-50%. Approximately 25% clearance required 1.7 treatments, 50% clearance required 2.8 treatments, 75% clearance required 5 treatments, 90% clearance required 6.4 treatments, and total clearance required 10.4 treatments (range, 4-16). Professional tattoos cleared as well as amateur tattoos, although the latter responded more rapidly, requiring approximately 3 fewer treatments to reach complete clearance; however, some professional tattoos also responded rapidly. Transient hypopigmentation is common (occurs in 50% of patients), but it is often not apparent until after 5-7 treatment sessions and usually resolves gradually over 1-12 months. As with the other Q-switched lasers, hyperpigmentation is more dependent on skin type and clears with hydroquinone and sunscreen. Transient surface textural changes, noted in about 10% of patients, usually resolve. On laser impact, the immediate flash of white light from the tattoo is followed by epidermal whitening and slight edema, as seen with both the QSRL and the Q-switched Nd:YAG laser. When higher fluences are used, purpura is noticed, and pinpoint bleeding may occur. Tissue splatter and erosions were not seen at any of the fluences used with the 100-nanosecond pulse width; however, the shorter 50-nanosecond pulse width, which reportedly increases tattoo clearance, is associated with more epidermal debris. Therefore, increasing the fluence up to the maximum available without causing pinpoint bleeding may prevent the problems of working in a bloody field and possible tissue trauma. In summary, the Q-switched alexandrite laser is effective and safe for removing blue, black, and green tattoo pigment. Approximately 4-10 treatments performed at 1- to 2-month intervals usually clear the tattoo without scarring; however, one half of patients develop transient hypopigmentation. The flashlamp-pulsed laser (510 nm, pulse width of 300 ± 100 ns) was developed as a companion to the Q-switched alexandrite laser to treat epidermal melanocytic lesions. This wavelength is also well absorbed by red pigment, and the pulse width is short enough to fragment ink granules. Successful clearing without scarring usually occurs in 3-7 treatments performed at 1-month intervals using 3-3.75 J/cm2. Purple, orange, and yellow pigments require an average of 5 treatments for complete ink removal. No hypopigmentation, textural change, or scarring is noted. Histologically, fragmentation of red pigment particles is observed, followed by macrophage engulfment. In addition, because of the epidermal absorption of this laser, transepidermal ink loss occurs. Early on, patients were treated every 4 weeks. In the alexandrite study, of the 4 patients unable to return for their scheduled treatment, 2 patients went 3 months and 2 patients went 5 months between treatments. Two of these 4 patients reported progressive and gradual clearing of the tattoo during the prolonged interval between treatment sessions; the other 2 patients noticed immediate improvement only, which then stabilized without further clearing. The appropriate treatment interval is critical and yet poorly understood. To study different treatment intervals, one group of patients received 3 treatments within 7-10 days and then no treatment for 3 months, a second group had single treatments at 2-month intervals, and the third group had single treatments at 1-month intervals. No difference in the rate of tattoo clearing was seen. All 3 treatment intervals resulted in approximately 50% clearing after 3 treatment sessions; however, as the number of treatments increases, the potential for tissue reaction also increases. The main parameters include pulse duration, wavelength, fluence, and spot size. All of the Q-switched lasers are in the nanosecond range, and pulse width is predetermined by the laser. Wavelength is chosen based on the best available wavelength for the tattoo ink color. For example, red ink is best treated by a green wavelength (510 or 532 nm), and green ink is best treated by a red wavelength (694 or 755 nm). When melanin is present, the 1064-nm wavelength is the best choice to avoid disruption of the epidermis. Fluence should be sufficient to produce immediate whitening without immediate bleeding or blistering. Larger spot sizes provide deeper penetration and should be used as long as sufficient fluence can be obtained. This maximizes the distribution of laser light to the dermal pigment and minimizes cutaneous injury. Predicting the number of treatment sessions necessary for tattoo removal is difficult. Frequently, the initial treatment session produces a more dramatic response than subsequent sessions. Definite sites of clearing, corresponding to laser impacts, are often seen. Other tattoos are highly unresponsive during early treatment phases, although biopsy samples reveal fragmentation of tattoo granules. The response difference from one patient to another likely involves the efficiency of mobile macrophages in removing fragmented tattoo pigment debris, as well as the density and amount of tattoo pigment present. The speed of the macrophage response, as well as the maximum amount of pigment removed per session, likely varies from patient to patient and, to some extent, from treatment to treatment. The more superficial the tattoo pigment and the less the total volume of pigment, the fewer the number of treatments necessary to remove the pigment. In contrast to anecdotal reports about the QSRL and the Nd:YAG laser, new Q-switched alexandrite-treated tattoos clear faster, possibly because the location of newer tattoos is more superficial. New tattoos have sharp lines with bright colors; whereas, older tattoos are blurred, with indistinct lines and duller, bluer colors, presumably resulting from ink movement deeper into the dermis. Further studies are underway to explore these observations. In contrast to traditional Q-switched lasers, which have pulse durations in the nanosecond ranges, picosecond lasers have pulse durations of less than 1 nanosecond, allowing for even greater confinement of nonspecific thermal damage and increased photoacoustic effect. The first studies involving picosecond lasers for tattoo removal were conducted in 1998-1999. Ross and colleagues compared two nanosecond and picosecond Nd:YAG lasers for the treatment of tattoos and found that 12 of 16 tattoos responded better to the picosecond device. A similar study conducted the following year in tattooed guinea pigs demonstrated the superiority of a 795-nm picosecond titanium:sapphire laser versus a 752-nm Q-switched alexandrite laser. Despite these initial promising reports, however, it was over a decade later that picosecond lasers became widely available for the treatment of unwanted tattoos. Saedi et al conducted a prospective clinical trial testing the safety and efficacy of a picosecond 755-nm alexandrite laser on 15 patients with unwanted tattoos. Three of 15 patients did not complete the trial, but the remaining 12 all achieved over 75% clearance in an average of 4.25 treatment sessions. Blistering and swelling post treatment resolved within 1 week. At 3 months follow up, 20% displayed hypopigmentation and 13% displayed hyperpigmentation. Recalcitrant blue and green tattoo pigment was also found to be effectively treated with the picosecond alexandrite laser. In these studies, laser settings ranged from fluences of 2.1-4.1 J/cm2, pulse durations of 500-900 picoseconds, and spot sizes of 2.5-3.5 mm. Treatment intervals were 4-8 weeks. The increased melanin absorption seen with shorter wavelengths increases the risk for hypopigmentation. With 510-nm and 532-nm wavelengths, the hypopigmentation typically resolves; however, with the QSRL, long-term hypopigmentation is possible. However, hyperpigmentation is more related to the patient's skin type, with darker skin more prone regardless of the wavelength. Treatment with hydroquinones and broad-spectrum sunscreens usually resolves the hyperpigmentation within a few months, although, in some patients, resolution can be prolonged. Transient textural changes are often noted but resolve within 1-2 months; however, permanent textural changes and scarring are rare. If a patient is prone to pigmentary or textural changes, longer treatment intervals are recommended. Local allergic responses to many tattoo pigments have been reported, and allergic reactions to tattoo pigment after Q-switched laser treatment are also possible. Unlike the destructive modalities previously described, Q-switched lasers mobilize the ink and may generate a systemic allergic response. If an allergic reaction to ink is noted, Q-switched laser treatment is not advised. Erbium and high-energy, pulsed carbon dioxide lasers can de-epithelialize the tattoo, promoting transepidermal elimination of the ink. Multiple treatments are required, and the risk for dyspigmentation and scarring is increased. Oral antihistamines and anti-inflammatory steroids, such as prednisone, have also been used. Paradoxic darkening of flesh-tone, red, and white tattoo inks with QSRL, Q-switched Nd:YAG, and Q-switched alexandrite lasers has been reported. In vitro tests with various tattoo pigments in agar found that a number of pigments (most containing iron oxide or titanium dioxide) change color when irradiated with Q-switched laser energy. Iron oxide changes color from brown to black when heated above 1400°C as ferric oxide is ignited. In clinical practice, multiple colors, including flesh tones, red, white, and brown containing pigments (iron oxide, titanium dioxide) and several green and blue tattoo pigments, changed to black when irradiated with Q-switched laser pulses. This change likely results from an oxidation-reduction reaction or the ignition of ferric oxide above 1400°C. These reactions require the extreme temperatures generated during the short pulse of Q-switched lasers; several hundreds to thousands of degrees celsius are estimated. Approach the laser treatment of cosmetic tattoos with caution, especially those of red or flesh tone. The resulting gray-black tattoo may prove difficult to remove and is certainly more visible than the flesh tone; therefore, test sites are recommended with patient consent. If darkening occurs, immediately re-treat the area, then wait several weeks to assess the darkened tattoo's response. If it has lightened significantly, treatment can proceed. Q-switched lasers seem ideal for removing large areas of black facial tattoos (tarsal fanning of pigment, eyebrow tattoo). However, the beam size (2-6.5 mm) may make removal of small dots of precisely confined tattoo pigment (eg, eyeliner tattoo) technically difficult without risk of temporary or permanent hair loss from heat damage to the terminal hair. High-energy short pulses cause a pressure shock wave that ruptures blood vessels and aerosolizes tissue (with potentially infectious particles), requiring a barrier or a cone device to protect the operator from tissue and blood contact. Lower fluences largely eliminate this problem but result in more treatment sessions. Scarring or tissue textural changes are also attributable to hot spots within the beam and pulse-to-pulse variability. Maintaining a high-energy output with a larger spot size (which decreases fluency) is equally effective, with less hazard to the operator and fewer adverse effects (less epidermal disruption) for the patient. Direct comparison studies of the various available wavelengths are difficult because treatment parameters, including pulse width, spot size, and fluence, are hard to standardize and results are therefore often inconclusive. Several comparative studies have been performed by using different lasers on the same tattoos. A comparison of the QSRL and Nd:YAG lasers found them equally effective in removing black ink; however, the QSRL was more effective in removing green ink. A second comparison of the QSRL and Nd:YAG lasers was limited to 1 treatment session, and a similar response was noted. After 1 month, the Nd:YAG caused more textural change and hyperpigmentation than the QSRL (possibly related to the smaller spot size used), and the QSRL caused more hypopigmentation. Comparisons between the QSRL and alexandrite lasers revealed that the QSRL removed more pigment but caused more textural change, hypopigmentation, and hair loss. A comparison at 2-3 treatment sessions may not be optimal because only 50-60% of the tattoo has been removed and the speed and efficacy of tattoo removal, as well as the avoidance of textural changes, scarring, hair loss, and pigment alterations, must be examined. In summary, Q-switched lasers provide a dramatic improvement over previous modalities for tattoo removal. Appropriate wavelength choice facilitates clearing of multicolored tattoos. Approach cosmetic tattoos with caution. Picosecond lasers are superior to traditional Q-switched lasers in both safety and efficacy. Further comparative trials amongst picosecond devices are required to optimize treatment parameters. The public's acceptance of cosmetic facial tattoos to simulate makeup was surprising and has stirred medical controversy. The use of the technique by estheticians, tattoo artists, and nurse practitioners, as well as by physicians, followed. In 1987, it was estimated that more than 75,000 persons had undergone various types of cosmetic dermal pigmentation procedures. Black dye is primarily ferric oxide, which is relatively inert. Tissue examined 6 weeks after blepharopigmentation revealed an absence of inflammation. Carbon and titanium oxide are also often present, and many other metals have been detected in the dyes by x-ray microanalysis. Many of the dyes are supplied by a variety of sources, some unlicensed. Fortunately, complications are rare. One allergic granuloma has been reported, as has one case of eyelid margin necrosis, with loss of eyelashes and secondary cicatricial entropion. By far, the most common complication is misapplication of the pigment. Pigment placement is accomplished with an instrument that uses oscillating disposable needles, which penetrate to a fixed depth of 1.2 mm. Microscopic examination of tattooed eyelid tissue reveals pigment granules extending to a depth of 1.5 mm in the dermis and connective tissue of the muscle fibers of the orbicular ocular muscle. Virtually all implanted pigment is within the cytoplasm of macrophages, which persist at the site of injection. Pigment migration was reported in 5% of patients and is believed to be secondary to loss of pigment placed too superficially in the epidermis. A particularly disastrous complication, termed pigment fanning, is believed to be the result of tattoo pigment placed so deep that it enters the tarsus fibrous tissue of the lid and spreads in this tissue plane, causing a fan-shaped pigmentation of the entire lid. Fortunately, all Q-switched lasers can effectively treat this condition. Techniques that are reportedly used for removing permanent cosmetic tattoos include surgical excision,  scraping pigment off with a chelation curette, ablation of the tattoo with an argon laser, and injection of tannic acid with a tattoo needle. Surgical excision of a few misplaced dots is feasible and can be accomplished with a punch excision or a tiny ellipse or curettage of the spots. However, excision of an entire line of pigment is complicated by the presence of eyelashes within the tattoo, with possible postoperative entropion or ectropion, or unacceptable scarring or distortion of the vermilion border with removal of a lip line tattoo. Pulsed carbon dioxide lasers (10,600 nm) can provide controlled, precise removal of tattoo pigment in delicate areas, such as the eyelid and the eyebrow. 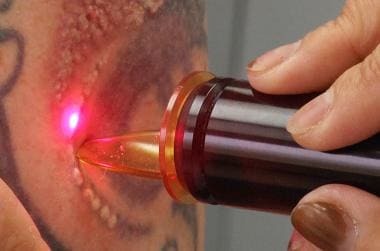 Prior to pulsed carbon dioxide laser treatment, skin containing the tattoo pigment is infiltrated with 1% lidocaine containing 1:100,000 U epinephrine. During the procedure, the eye is protected with a metallic scleral contact lens after instillation of topical proparacaine hydrochloride 0.5% drops into the conjunctival cul-de-sac. The wounds usually heal by secondary intention with imperceptible scars within several weeks, without distortion of lid margins or loss of eyelashes. For red lip liner or other cosmetic tattoos, the frequency-doubled Q-switched Nd:YAG (532 nm) and the pigmented lesion dye laser (510 nm, Candela) work well when used as previously discussed. Test sites are recommended because flesh-tone, red, and white tattoo ink darkening can occur with any Q-switched laser. Although, in most patients, subsequent laser treatments successfully remove the darkened ink, this can be difficult, and surgical excision may be necessary. Approach the laser treatment of flesh-tone tattoos with caution. The resulting gray-black tattoo may be difficult to remove and is certainly more visible than the original flesh tone; therefore, test sites are recommended. Q-switched lasers seem ideal for removing large areas of black facial tattoos (eg, tarsal fanning of pigment, eyebrow tattoo). However, beam size (2-6.5 mm) may make the removal of small dots of precisely confined tattoo pigment, as found in eyeliner tattoos, technically difficult without resulting in temporary or permanent hair loss from heat damage to the terminal hair. Because of the facial location of these tattoos, avoiding scarring secondary to treatment is essential. Approach the use of high fluences and very short pulses with the Q-switched lasers with caution because they may increase the risk of tissue reaction. Taylor CR, Anderson RR, Gange RW, Michaud NA, Flotte TJ. Light and electron microscopic analysis of tattoos treated by Q-switched ruby laser. J Invest Dermatol. 1991 Jul. 97(1):131-6. [Medline]. Patipa M, Jakobiec FA, Krebs W. Light and electron microscopic findings with permanent eyeliner. Ophthalmology. 1986 Oct. 93(10):1361-5. [Medline]. Kent KM, Graber EM. Laser Tattoo Removal: A Review. Dermatol Surg. 2011 Nov 2. [Medline]. Adatto MA, Halachmi S, Lapidoth M. Tattoo removal. Curr Probl Dermatol. 2011. 42:97-110. [Medline]. Bernstein EF, Schomacker KT, Basilavecchio LD, Plugis JM, Bhawalkar JD. A novel dual-wavelength, Nd:YAG, picosecond-domain laser safely and effectively removes multicolor tattoos. Lasers Surg Med. 2015 Jul 14. [Medline]. Khunger N, Molpariya A, Khunger A. Complications of Tattoos and Tattoo Removal: Stop and Think Before you ink. J Cutan Aesthet Surg. 2015 Jan-Mar. 8 (1):30-6. [Medline]. Crittenden FM. Salabrasion-removal of tattoos by superficial abrasion with table salt. Cutis. 1971. 7:295. Koerber WA Jr, Price NM. Salabrasion of tattoos. A correlation of the clinical and histological results. Arch Dermatol. 1978 Jun. 114(6):884-8. [Medline]. Strong AM, Jackson IT. The removal of amateur tattoos by salabrasion. Br J Dermatol. 1979 Dec. 101(6):693-6. [Medline]. Goldman L, Rockwell RJ, Meyer R, Otten R, Wilson RG, Kitzmiller KW. Laser treatment of tattoos. A preliminary survey of three year's clinical experience. JAMA. 1967 Sep 11. 201(11):841-4. [Medline]. Apfelberg DB, Maser MR, Lash H. Argon laser treatment of decorative tattoos. Br J Plast Surg. 1979 Apr. 32(2):141-44. [Medline]. Fitzpatrick RE, Goldman MP. Tattoo removal using the alexandrite laser. Arch Dermatol. 1994 Dec. 130(12):1508-14. [Medline]. Apfelberg DB, Maser MR, Lash H, White DN, Flores JT. Comparison of argon and carbon dioxide laser treatment of decorative tattoos: a preliminary report. Ann Plast Surg. 1985 Jan. 14(1):6-15. [Medline]. Reid R, Muller S. Tattoo removal with laser. Med J Aust. 1978 Apr 8. 1(7):389. [Medline]. McBurney EI. Carbon dioxide laser treatment of dermatologic lesions. South Med J. 1978 Jul. 71(7):795-7. [Medline]. Beacon JP, Ellis H. Surgical removal of tattoos by carbon dioxide laser. J R Soc Med. 1980 Apr. 73(4):298-9. [Medline]. Groot DW, Arlette JP, Johnston PA. Comparison of the infrared coagulator and the carbon dioxide laser in the removal of decorative tattoos. J Am Acad Dermatol. 1986 Sep. 15(3):518-22. [Medline]. Kilmer SL, Lee MS, Anderson RR. Treatment of multi-colored tattoos with the Q-switched Nd:YAG laser (532 nm): a dose response study with comparison to the Q-switched ruby laser. Lasers Surg Med Suppl. 1993. 5:54. Levine VJ, Geronemus RG. Tattoo removal with the Q-switched ruby laser and the Q-switched Nd:YAGlaser: a comparative study. Cutis. 1995 May. 55(5):291-6. [Medline]. Reid WH, McLeod PJ, Ritchie A, Ferguson-Pell M. Q-switched Ruby laser treatment of black tattoos. Br J Plast Surg. 1983 Oct. 36(4):455-9. [Medline]. Taylor CR, Gange RW, Dover JS, Flotte TJ, Gonzalez E, Michaud N, et al. Treatment of tattoos by Q-switched ruby laser. A dose-response study. Arch Dermatol. 1990 Jul. 126(7):893-9. [Medline]. Scheibner A, Kenny G, White W, Wheeland RG. A superior method of tattoo removal using the Q-switched ruby laser. J Dermatol Surg Oncol. 1990 Dec. 16(12):1091-8. [Medline]. Levins PC, Grevelink JM, Anderson RR. Q-switched ruby laser treatment of tattoos. Lasers Surg Med Suppl. 1991. 3:63. Kilmer SL, Anderson RR. Clinical use of the Q-switched ruby and the Q-switched Nd:YAG (1064 nm and 532 nm) lasers for treatment of tattoos. J Dermatol Surg Oncol. 1993 Apr. 19(4):330-8. [Medline]. Jones A, Roddey P, Orengo I, Rosen T. The Q-switched ND:YAG laser effectively treats tattoos in darkly pigmented skin. Dermatol Surg. 1996 Dec. 22(12):999-1001. [Medline]. Grevelink JM, Duke D, van Leeuwen RL, Gonzalez E, DeCoste SD, Anderson RR. Laser treatment of tattoos in darkly pigmented patients: efficacy and side effects. J Am Acad Dermatol. 1996 Apr. 34(4):653-6. [Medline]. Tammaro A, Fatuzzo G, Narcisi A, Abruzzese C, Caperchi C, Gamba A, et al. Laser removal of tattoos. Int J Immunopathol Pharmacol. 2012 Apr-Jun. 25(2):537-9. [Medline]. Ross V, Naseef G, Lin G, Kelly M, Michaud N, Flotte TJ, et al. Comparison of responses of tattoos to picosecond and nanosecond Q-switched neodymium: YAG lasers. Arch Dermatol. 1998 Feb. 134 (2):167-71. [Medline]. Herd RM, Alora MB, Smoller B, Arndt KA, Dover JS. A clinical and histologic prospective controlled comparative study of the picosecond titanium:sapphire (795 nm) laser versus the Q-switched alexandrite (752 nm) laser for removing tattoo pigment. J Am Acad Dermatol. 1999 Apr. 40 (4):603-6. [Medline]. Saedi N, Metelitsa A, Petrell K, Arndt KA, Dover JS. Treatment of tattoos with a picosecond alexandrite laser: a prospective trial. Arch Dermatol. 2012 Dec. 148 (12):1360-3. [Medline]. Brauer JA, Reddy KK, Anolik R, Weiss ET, Karen JK, Hale EK, et al. Successful and rapid treatment of blue and green tattoo pigment with a novel picosecond laser. Arch Dermatol. 2012 Jul. 148 (7):820-3. [Medline]. Alabdulrazzaq H, Brauer JA, Bae YS, Geronemus RG. Clearance of yellow tattoo ink with a novel 532-nm picosecond laser. Lasers Surg Med. 2015 Apr. 47 (4):285-8. [Medline]. Pinto F, Große-Büning S, Karsai S, Weiß C, Bäumler W, Hammes S, et al. Neodymium-doped yttrium aluminium garnet (Nd:YAG) 1064-nm picosecond laser vs. Nd:YAG 1064-nm nanosecond laser in tattoo removal: a randomized controlled single-blind clinical trial. Br J Dermatol. 2017 Feb. 176 (2):457-464. [Medline]. Lorgeou A, Perrillat Y, Gral N, Lagrange S, Lacour JP, Passeron T. Comparison of two picosecond lasers to a nanosecond laser for treating tattoos: a prospective randomized study on 49 patients. J Eur Acad Dermatol Venereol. 2018 Feb. 32 (2):265-270. [Medline]. Ross EV. The picosecond revolution and laser tattoo treatments: are shorter pulses really better?. Br J Dermatol. 2017 Feb. 176 (2):299-300. [Medline]. Au S, Liolios AM, Goldman MP. Analysis of incidence of bulla formation after tattoo treatment using the combination of the picosecond Alexandrite laser and fractionated CO2 ablation. Dermatol Surg. 2015 Feb. 41 (2):242-5. [Medline]. Bae YC, Alabdulrazzaq H, Brauer J, Geronemus R. Successful treatment of paradoxical darkening. Lasers Surg Med. 2016 Feb 2. [Medline]. Angres GG. Angres permalid-liner method: a new surgical procedure. Ann Ophthalmol. 1984 Feb. 16(2):145-8. [Medline]. Angres GG. Blepharopigmentation procedure guidelines. Plast Reconstr Surg. 1986 Feb. 77(2):338. [Medline]. Angres GG. Blepharo-and dermapigmentation techniques for facial cosmesis. Ear Nose Throat J. 1987 Sep. 66(9):344-53. [Medline]. Putterman AM, Migliori ME. Elective excision of permanent eyeliner. Case report. Arch Ophthalmol. 1988 Aug. 106(8):1034. [Medline]. Fogh H, Wulf HC, Poulsen T, Larsen P. Tattoo removal by overtattooing with tannic acid. J Dermatol Surg Oncol. 1989 Oct. 15(10):1089-90. [Medline]. Disclosure: Serve(d) as a speaker or a member of a speakers bureau for: Syneron.